The story of the Prophet Musa (as) and his encounter with the mysterious teacher in the Qur’an is a well-loved story among Muslims about which there has been much speculation and reflection. The story is of particular interest to seekers in Islam’s mystical tradition. 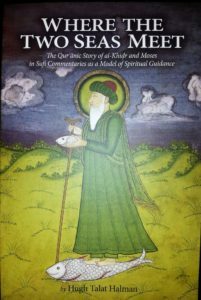 This book reviews what has been said about the tale in Sufi commentaries. Included are stories from important Sufi figures from the past such as Rumi, Hafiz and Ibn ‘Arabi. Some of the themes that are emphasized include the master-disciple relationship and how Al-Khidr has served as a model for Sufi Masters, companionship, subtleties of the path, death, inner knowledge and the desire for symbolic immortality. The book also speaks of the relationship between Al-Khidr and the figures of Alexander the Great and Saint George in the Muslim tradition. The details of the story given in the Quran are analyzed in the book alongside interesting but remarkably different lines on which to interpret the individual events. In the process there is much to be learned about cross-cultural spiritual tales, the Sufi tradition and one’s own spiritual journey. This book is one of the many books in the MARC library collection.